HR DATA LOCKED AWAY IN DISPARATE SYSTEMS? 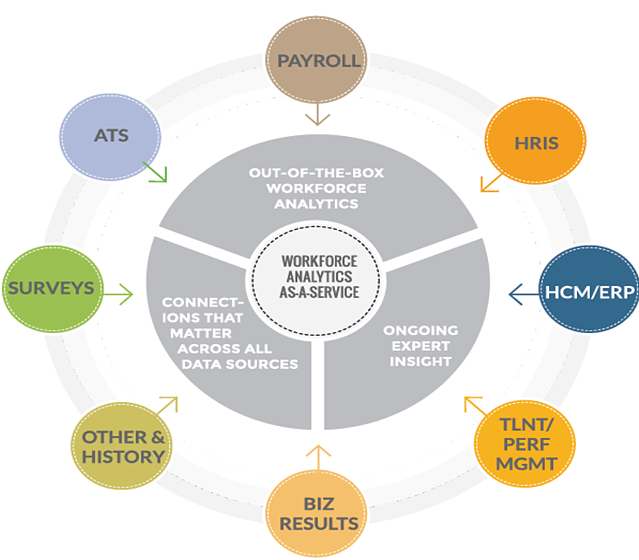 THE NEWEST CATEGORY OF HR TECH - THE WORKFORCE ANALYTICS PUREPLAY - IS BUILT TO INTEGRATE ALL OF YOUR DATA, PLUS DELIVER END-TO-END HR REPORTING & WORKFORCE ANALYTICS. Your workforce data is precious, confidential, under-utilized - and YOURS to leverage - don't let anyone (internal or an external vendor) have you believe otherwise. 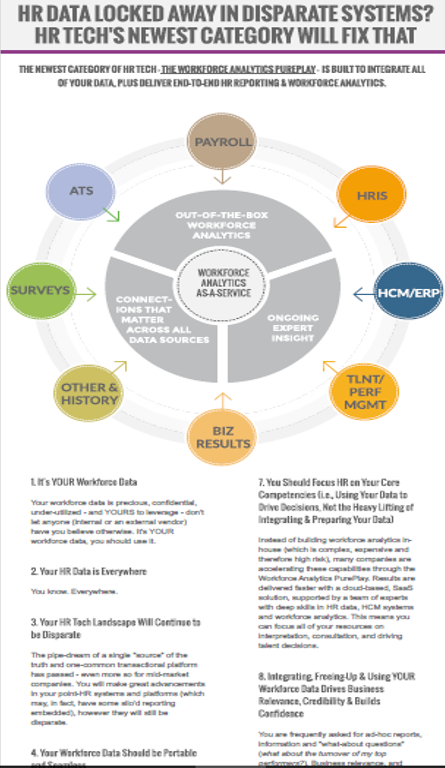 It's YOUR workforce data, you should use it. The pipe-dream of a single "source" of the truth and one-common transactional platform has passed - even more so for mid-market companies. You will make great advancements in your point-HR systems and platforms (which may, in fact, have some silo'd reporting embedded), however they will still be disparate. Many transactional HR Technology solutions make it difficult for you to access, integrate-with, move around and mash together your data. You need simple, yet powerful approaches to getting amplified value from connecting and integrating your HR data. Simply put, a Workforce Analytics PurePlay is a completely different species - one which is solely designed to manage, segment and help you discover the things which are most important in your mountains of HR and workforce data. It isn't a transactional system which is far less sophisticated when it comes to delivering business intelligence and management information. A recent study of nearly 1,000 mid-market US companies* identified the lack of data integration as the number 1 reason why HR Technology is replaced. The Workforce Analytics PurePlay now means you don't have to throw away the baby with the bathwater. Instead of building workforce analytics in-house (which is complex, expensive and therefore high risk), many companies are accelerating these capabilities through the Workforce Analytics PurePlay. Results are delivered faster with a cloud-based, SaaS solution, supported by a team of experts with deep skills in HR data, HCM systems and workforce analytics. This means you can focus all of your resources on interpretation, consultation, and driving talent decisions. You are frequently asked for ad-hoc reports, information and "what-about questions" (what about the turnover of my top performers?). Business relevance, and success in the eyes of your stakeholders, depends on your ability to deliver rapid, discoverable and scenario-specific insight into making smarter hiring decisions, retaining key employees and connecting people performance to business performance. When we hear HR Tech vendors talking about how their solution has predictive analytics and machine learning algorithms - some of us are impressed, and others completely turned off. You see, HR Reporting & Workforce Analytics (People Analytics, Talent Analytics etc.) is as broad a category as you can imagine - and no different to the diverse options found when you are selecting a new ATS, a car for your commute to work, or a beach vacation. There are different needs, different solutions and one-size does not fit all. Our perspective and experience is that mid-market companies can deliver significant benefits from integrated data, HR reporting & descriptive workforce analytics. In fact, thought leader David Creelman strongly believes the key to success is HR dusting off their basic math skills (counts, percentages, rates, etc.) - we couldn't agree more. Very few in HR need the exotic supercar to get to the office. And while there's absolutely a fit for advanced analytics in some companies - mid-market companies are often looking for pragmatic answers to the here-and-now - supported through powerful descriptive workforce analytics. 10. We Want to Help You Face the Facts. You Need a Single View of the Truth - HR Tech That Both Integrates All of Your Employee, Talent & Workforce Data and Acts as Your HR Reporting & Analytics Platform. This is exactly why we built PeopleInsight - the one-and-only Workforce Analytics PurePlay focused on companies with less than 5,000 employees - and how many of North America's best mid-market companies make data driven workforce and people decisions today. Let PeopleInsight do the heavy-lifting where your data is concerned, so you can spend time where it matters - delivering results to the business. See how we can help - watch our short demo now!